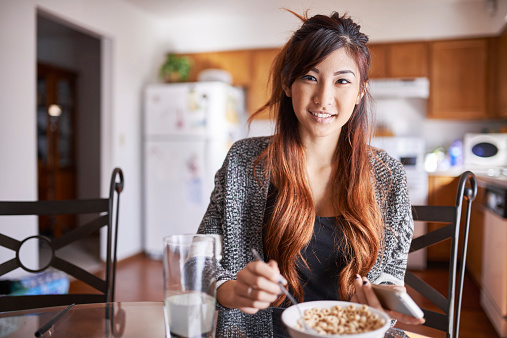 A new study examines the effects of a high-protein breakfast vs. a normal-protein breakfast on glucose and appetite control among habitual breakfast-skipping adolescents. Research shows that increased protein intake is known to improve body weight management by reducing body weight and preventing weight regain. Some studies even suggest that long-term adherence to high-protein diets may lower blood fat, blood pressure, waist circumference, and fasting blood glucose levels. Twenty-eight overweight/obese adolescents between the ages of 13 and 20 participated in this study headed by researchers at the University of Missouri. Besides weight status, participants were otherwise healthy individuals who were habitual breakfast skippers. One group was provided with a high-protein breakfast (35 grams of protein), another group was given a normal- protein breakfast (13 grams of protein), while a third group continued to skip breakfast over a 12-week period. Measurements were taken at baseline and at the end of the 12 weeks. Participants reported their daily intakes as well as any feelings of hunger. Approximately 60% of adolescents regularly skip breakfast—a habit that has been linked with obesity and being overweight. Previous studies suggest that breakfast-skipping may also increase one’s risk of developing diabetes. University of Missouri-Columbia, “Protein-packed breakfast prevents body fat gain in overweight teens: High-protein breakfast also improves teens’ glycemic control,” ScienceDaily web site August 12, 2015; www.sciencedaily.com/releases/2015/08/150812165923.htm.